Lindsey Nichole Theissen, 32, allegedly bit her mother for taking too long to drive her for cigarettes in Sebastian. 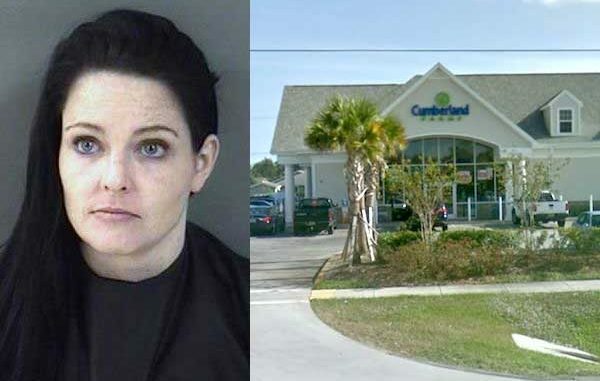 SEBASTIAN – A 32-year-old Sebastian woman was arrested early Tuesday morning after she bit her mother for taking too long to drive her to Cumberland Farms for cigarettes, according to the Indian River County Sheriff’s Office. Lindsey Nichole Theissen, 32, was charged with Misdemeanor Battery Domestic Violence Tuesday after deputies observed injuries to her mother. The mother told law enforcement that Theissen pulled her hair and bit her on the hand and arm, the report said. The mother declined emergency medical services for her injuries. “[the mother] stated that Lindsey became upset that she was taking too long to give Lindsey a ride to Cumberland Farms to that she can buy cigarettes,” the deputy said. On the way to Cumberland Farms, the two continued to argue. The mother said Theissen took her cell phone away and refused to give it back after repeated demands, according to the report. Once in the parking lot of the Cumberland Farms, located at 957 Sebastian Blvd., the incident became physical when the mother tried to take back her phone from Theissen. That’s when she says Theissen pulled her hair, “bit her right hand, and also bit her upper right arm,” the arrest affidavit said. “I observed a large quantity of gray hair in the passenger seat and center console,” the deputy said. The deputy also observed lacerations and swelling on the mother’s right hand and upper arm. Theissen admitted, in a written statement, that a verbal altercation started when her mother was taking too long to drive her to the store for cigarettes. She said her mother drove past the Cumberland Farms and that’s why she took her cell phone. Theissen said her mother grabbed her hair and threatened to call the police. When asked about her mother’s injuries during the altercation, Theissen told deputies that it was self-defense. Theissen was transported to the Indian River County Sheriff’s Office for booking. As of 4:00 p.m. Tuesday, she was still incarcerated on a $1,000 bond.